Leave it up to Amazon to develop a speaker that you can listen and talk to at the same time. The two models — the Echo and the Tap — are the company’s smart home speaker/personal assistant devices that can play your favorite tunes and order take-out in a single beat. The Tap costs $50 less, but in terms of smarts, the Echo’s advanced intelligence takes the grade. Which speaker is worth your money? Outdoor and mobile listeners might want to choose the Tap, while those desiring an immersive, hands-off home experience should consider springing for the Echo. And of course, some will want both. Before you buy, we did the research for you. Let’s see how these two stack up. What we found: The Tap is a departure from the Echo. It’s $50 less, considerably smaller and more mobile. What you’ll learn: The Echo is “always on” — just talk to it and receive a response — but you must “tap and ask” the Tap. To enable it, users have to be close enough to physically tap the microphone button. From the outside, the Amazon Tap looks strikingly similar to the Echo. 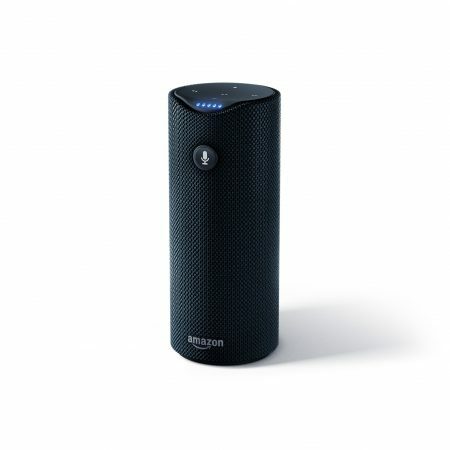 Both are slim, black cylindrical speakers with blue illuminating lights. The Tap is smaller, at 6.2 inches x 2.6 inches x 2.6 inches and 16.6 ounces. The Echo measures 9.25 inches x 3.27 inches x 3.27 inches and weighs 26.9 ounces. The more compact Tap is designed to be moved around, while the Echo is meant to be a more static fixture on a desk or countertop. If listening to music is your main reason for buying a speaker, the Tap and the Echo have you covered with Wi-Fi music streaming. Both can play music from some of the most popular services, including Prime Music, Spotify, Pandora, TuneIn and iHeartRadio. And both provide 360-degree, omni-directional audio for a more immersive listening experience. 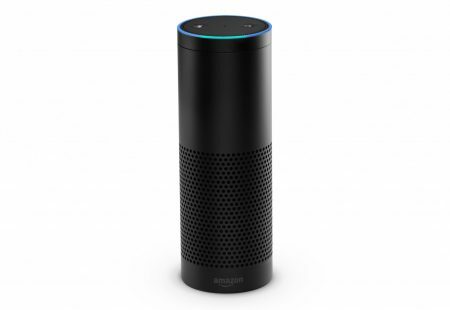 In addition to its Wi-Fi capabilities, the Echo can be paired with your smartphone via Bluetooth. The Tap also has Bluetooth functionality, so when you’re out of Wi-Fi range, you can connect your phone to play tunes, provided you have cell service. The major difference here is user input. The Echo offers hands-free listening. It’s like a DJ that’s always taking requests. Tap users, on the other hand, have to take one additional step, literally tapping the microphone button on the side of the speaker to request a tune. They may be speakers first and foremost, but these two Amazon products do much more than just play music. Most importantly, each is equipped with Alexa, Amazon’s voice service that looks up information and completes tasks based on spoken cues. The Echo and the Tap can also help users read the news, find weather reports, and order a pizza. The Echo’s Alexa capabilities are more advanced, though, thanks to features like far-field voice recognition. That means you can talk to the Echo from across the room, even if music is already playing. Both speakers are compatible with the Alexa App for Android, iOS, Fire and desktop devices. This app allows users to connect the device to their smart home devices, music services, digital books and more. The Echo and the Tap take different approaches to powering up. You simply plug the more stationary Echo into an outlet via a 6-foot power adapter/cable. The Tap is powered by a battery and boasts up to nine hours of continuous playback on a full charge. The product comes with a cable for recharging between uses. Tap is the winner for portability, but shoppers should keep in mind that it will need to be regularly recharged. The Amazon Tap retails for $129.99 from Amazon, while the Echo costs $179.99. Both are eligible for free shipping for Amazon Prime members. If you purchase the Tap, you can add an Amazon Tap sling cover to your order for an extra $19.99. This is a durable silicone covering with a clip loop that’s designed to protect your speaker and make it easier to carry while you’re on the go. It’s sold in black, blue, green, magenta, tangerine and white. The new Amazon Tap isn’t a more affordable version of the Echo; it’s a different product with different uses. If you’re seeking an always-on, at-home assistant that can play your favorite tunes and tell you the weather forecast, stick to the Echo. Simply plug it in, connect to the Internet, and you’re ready to go. If, however, you want to take Alexa’s ask-and-answer convenience with you when you leave home, opt for the Tap. It’s perfect for college students listening to their tunes between classes, busy commuters, or travelers heading to the great outdoors.